The easiest way to experience the best local restaurants in your office. Spork learns your team’s dietary restrictions, food allergies & meal preferences so we can customize meals to you! Review menus from local restaurants tailored to your group. Simply select the one that works best for your team! Need help deciding? A friendly Spork Bytes concierge will help guide you through the process. We’ll deliver and set up your meal exactly how you like it. Afterward, we’ll ask for your feedback. Your opinions and concerns make every meal that much better. With your input, we can ensure that meals fit your group just right. We partner with local restaurants to cater group office meals and events. We handle all of the logistics in ordering, delivering and setting up food for your group so you don't have to worry about a thing. A dedicated Client Concierge and advocate for your office. Great local food set up in your office just how you like it. With over 100,000 meals served, you can trust that we’ll get it right. We’re here for you. Need something? Just ask. We go out of our way to find the best popular restaurants, gourmet food trucks, pop up kitchens and top private chefs around to offer you a unique dining experience, delivered to your office, on time. We believe in quality and variety so you’re sure to experience something great, every meal. Your office has 5 vegetarians? We’ve got it covered. Your CEO is a vegan? No problem. The entire office is trying to go gluten-free? We’ll be sure they eat without wheat. Hand all of the details over to us and we’ll take care of the rest. We’ll build a customized menu for your group from our vendor network that caters to all of your needs and preferences. We make it easy by handling all logistics, including food discovery, menu development, delivery & family-style set up. A Spork Bytes Client Concierge will guide you through the process using our easy-to-use web application. Great food is just a few clicks away! Some of the best conversations in an office happen over a meal, but ordering food for your office can be difficult and time-consuming. A number of dietary restrictions, food allergies & meal preferences make it harder than ever to sort through a never-ending amount of new food options. Spork Bytes allows our clients the relief of knowing their office meal needs are met and the freedom to spend their time on working on their specific job duties. 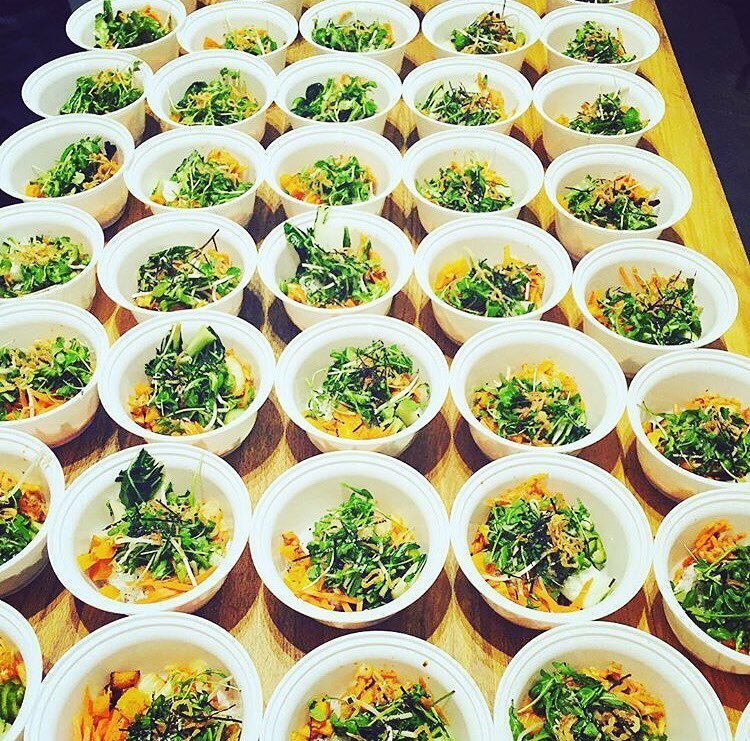 Spork Bytes is the easiest way to cater local food for your office. With Spork, you’ll have one point of contact for a variety of great food. We make it easy by handling all logistics, including food discovery, menu development, delivery & family-style set up. All you need to do is talk to a Spork rep and let us handle the rest. Reliable delivery and set up, great local food delivered to your office.